The right playground surfacing will depend on many factors such as budget, overall playground usage, site conditions and much more. 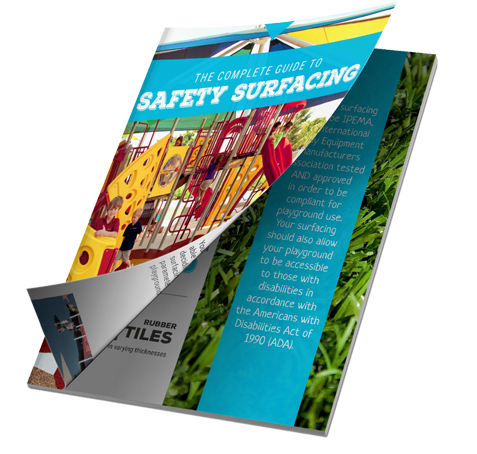 Our FREE Safety Surfacing Guide will break down the pros and cons of each type of playground surface. Though both are affordable and readily available, Sand and Pea Gravel have very limited application as playground surfacing options. Neither is ADA accessible, nor compliant through CPSC or ASTM for over a 5-foot fall height. As the most common safety surfacing, Engineered Wood Fiber will maintain its cushioning properties for the life of the playground, provided it is maintained at the depth required for the fall height of your playground. Another highly popular loose fill surfacing is Rubber Mulch. Out of all playground surface options, Rubber Mulch provides one of the best impact attenuation ratings through IPEMA and has the best warranty at 50-year warranty on impact attenuation. For a beautiful, natural look for your playground surfaces all year long, Synthetic Playground Turf is an ideal option. Turf has an attractive natural look giving the illusion of grass without all the allergens. Turf is also antimicrobial, so it helps to keep germs to a minimum. Poured-In-Place, often shortened to PIP, is a versatile two-layered unitary safety surfacing. It is installed at varying thicknesses to accommodate different fall heights – the thickness to fall height ratio is based upon guidelines set forth by the CPSC and ASTM as well as IPEMA testing and certification. Rubber Tiles offer superior shock absorption, low maintenance, long wear, and high accessibility. Tiles are manufactured from recycled and virgin rubber off-site and cured in a controlled environment allowing for consistency and uniformity in the product. Safety surfacing must be International Play Equipment Manufacturers Association (IPEMA) tested AND approved to be compliant for playground use. Your surfacing should also allow your playground to be accessible to those with disabilities by the Americans with Disabilities Act of 1990 (ADA). Every year, more than 200,000 playground-related injuries are treated in emergency rooms across the United States, and the vast majority of these injuries (over 70%) are due to falls to the ground. The Consumer Product Safety Commission (CPSC) and the American Society for Testing and Materials (ASTM) playground safety guidelines require all playground equipment to have an impact attenuating safety surfacing in place to help prevent critical head injuries. Your playground surface should also allow your playground to be accessible to those with disabilities by the Americans with Disabilities Act of 1990 (ADA). BYO Playground believes in fair play, no matter what kind of disability a child has. By including a playground that welcomes all children, you are promoting inclusive play, understanding and social development amidst a crucial learning stage in a child's life. 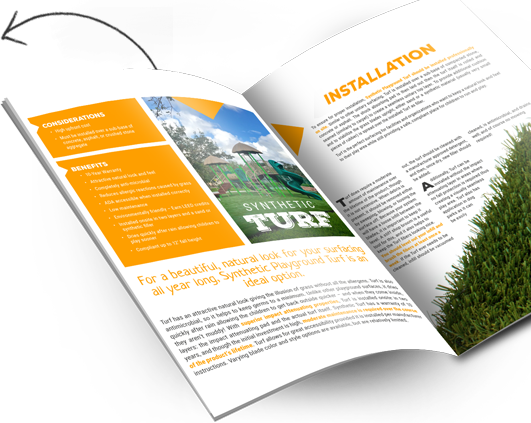 With your free guide, you'll learn the key aspects of each type of safety surfacing, including available warranties, color options, ADA accessibility, environmental factors, the highest compliant fall heights, upfront and maintenance costs and much more. Since safety surfacing is such a crucial part to any playground, knowing the right surfacing to choose at the right price and make a big impact, especially when it comes to meeting safety standards and meeting ADA compliance. BYO Playground’s Free Safety playground surfaces guide is a great addition to any playground surfaces planning package.